It was my honor to be the first non-US fellow selected by Ming Chen foundation for its comprehensive observorship. Due to this rare opportunity, I was fortunate to learn directly from Dr. Ming Chen, a great surgeon and mentor. The fellowship encompassed clinical practice, refractive surgery lessons as well as time to explore the beautiful Hawaiian islands. The training program was well-thought-out thus I had chance to attend ARVO and HOS annual meeting during while in Honolulu. To my surprise, instead of feeling overwhelmed, the learning experience in Hawaii was patient-centered, rewarding and inspiring. I highly recommend this observership to every resident who is eager to achieve more. On this culturally diverse island, Dr. Chen's clinic visit was fully booked with patients from various nations. I was impressed by Dr. Chen’s language proficiency; he was able to switch between 4 to 5 languages to communicate with patients effectively and to calm them down with ease. Every staff was equally welcoming and professional which made the fellowship experience even more rewarding. The staff and Dr. Chen have demonstrated what it’s like to have great teamwork. Patients coming in for ocular symptoms relief were given special attention with adequate chair time and thorough explanation of their conditions and subsequent treatment plan. For patients coming in for operation consultation, their individual expectations were fully addressed based on different cultural preferences. Seeing how the patients at Dr. Chen’s clinic were always smiling and relaxed left a deep impression in my heart. Patient-Physician relationship was based on trust, and it was clear every patient there trusted Dr. Chen with his/her vision. All efforts spent in providing best patient-centered care at Dr. Chen’s clinic helped me to pay extra attention minute communication details to provide better patient experience. During the ARVO meeting, Dr. Chen introduced me to his recent finding in manual AK with ORA for fine-tuning in astigmatism correction. I was impressed by his keen observation and passion in refractive surgery. 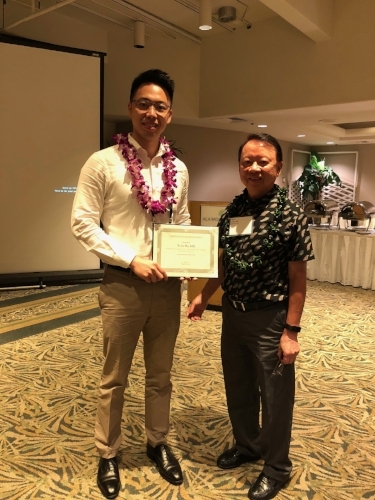 He invited me to present my current study at the 34th annual Hawaii Ophthalmology Society Meeting. That was an memorable experience for me - meeting top physician-scientists who flew in from across the globe, being in a room full of physicians with enthusiasm in the same research realm, and asking these experts questions on my research and got instant problem solving opportunities. 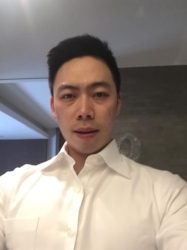 A great mentor always wanted to inspire his mentee to become his better self, and Dr. Chen has continued to challenge me while providing effective guidance and encouragement. After this program I have not only grown professionally, but also personally to be not afraid to dream big. In Dr. Chen's clinics, he showed me how to diagnose patients efficiently with cutting-edge equipment while using effective and innovative methods. He demonstrated how to treat patients based on up-to-date finding and latest guidelines. The way he delicately consulted patients with dry eye, glaucoma and cataract patients inspired me to always put patients first. In Dr Chen's OR, I was able to learn how to improve surgical outcome, utilize latest technology with LenSx, ORA and Verion from him. Not only did he coach me on avoiding pitfalls during cataract surgery, Dr.Chen instructed me to use his own nomogram based on his experience with ORA to improve precision of astigmatism correction. Dr. Chen’s Ming Chen Foundation training program is the greatest learning experience abroad I have had as a Refraction Fellow. Dr. Chen’s impeccable skill, the transcendent wisdom and generosity to share and to guide fellows are reasons this program should be everyone’s first choice. I hope to offer my deepest gratitude to Dr. Chen for his mentorship and guidance. After this observorship I was able to define the path I should take to reach my future goal. This program and scholarship are tokens for one's devotion and commitment to education in medicine, which has inspired me to follow his footsteps in the future.